I haven’t read The Brothers’ War in quite some time, which is a pretty big oversight on my part. It’s my personal favorite Magic novel, and an indication of what tie-ins can achieve when they put some effort into them. Traxos appears in that novel, although I don’t think his name was given there; he was a special, very powerful dragon engine that led Mishra’s forces at the destruction of Kroog. I really did not expect to ever see him in card form, not least since we’ve seen more recent, unrelated artificial dragon designs; but I should have known that neither time nor apocalypse could tarnish Mishra’s genius. It has also been some time since I’ve seen a creature with a significant drawback at all, much less one that invites exploration so much as Traxos does. A 7/7 trampling creature for four mana is tempting under any circumstances, and asking that you use historic spells to get a more favorable sequence from him is not so much of a drawback when you take into account how powerful many of those historic spells are. Cards like The Antiquities War, Icy Manipulator, and Mox Amber go with him very well, though the mana costs involved will see to it that he stays mainly fair in Standard. But, there are formats with more than one Mox, plus Sol Ring, Mana Vault, Ancient Tomb, Null Rod, Chalice of the Void . . .
Traxos is one of Mishra’s greatest creations and after millennia of slumber it has reactivated. I guess somebody cast a Historic spell. A 7/7 with Trample for 4 generic mana is… yeah, that’s pretty nice. The catch of course is that you have to constantly jump start this war machine by casting Historic spells. Fortunately every artifact is Historic so this isn’t a very difficult feat. When life gives you lemons, you cast two artifact spells and give Traxos pseudo-Vigilance. Traxos’ biggest flaw, along with with artifact creature, is that every color has a way of killing it. Which everyone at the table will want to. 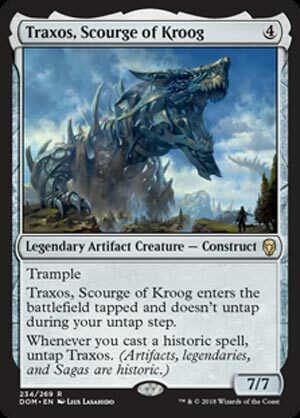 Traxos has a lot of potential as a Colorless Commander. The resident Vintage-relevant plant of Dominaria…wait, what? In an interesting twist, Traxos has had the largest impact on Vintage, of all formats. The format where Moxen, Lotuses of the black variety, and Mishra’s Workshop are all legal. It’s doable to get Traxos into play on turn 1 in that deck, untap him each turn, and smash many faces with it. The untap trigger is a lot easier to work with than most creatures of his ilk, and the upshot (a very efficient, undercosted trampler) is pretty powerful. He can also put in work in other formats, as his rate is efficient and there are reliable ways to untap him, like Voltaic Key and Voltaic Servant. Traxos may not be the strongest card of the set, but he has a niche all the same, and I’d say he’ll see play across multiple formats.